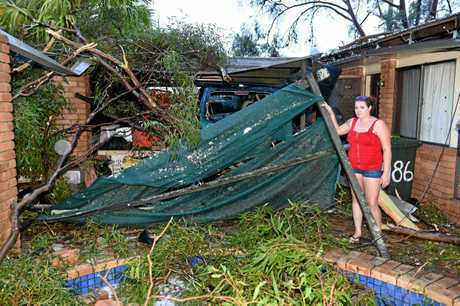 A MASSIVE clean-up operation will start today after super storm cells packing tornado-driven hail cut a swath of devastation across Queensland. 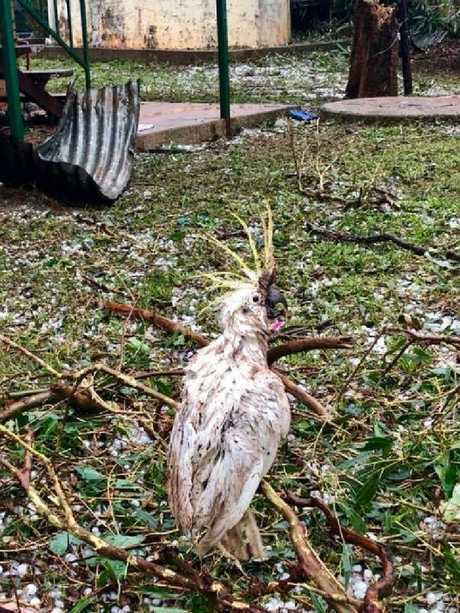 The storm began shortly after midday yesterday, with tennis-ball-sized hail falling at Kumbia near Kingaroy, tearing off roofs and even knocking birds from the trees. But the storm did more than create structural and wildlife damage. Emergency crews helped two women and a baby who suffered cuts when their car was savaged by hail near Kingaroy while another person was rescued after lightning dropped a tree across their vehicle near Beaudesert. Pictures have this morning emerged from the incident near Kingaroy, with Fiona Simpson posting on social media about her experiences. "I've learnt my lesson, never drive in a hail storm," she wrote. 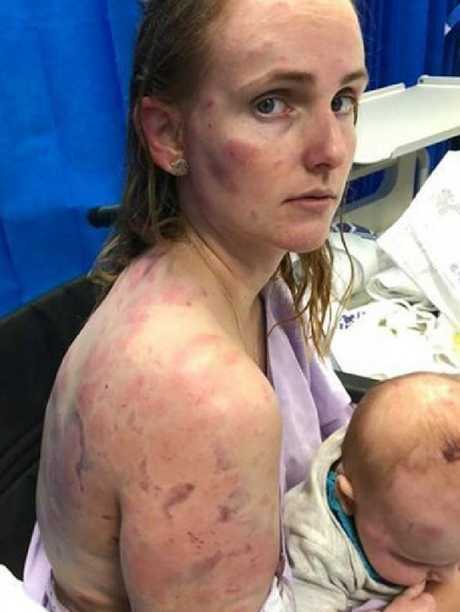 Pictures show her back covered in huge bruises which she said were caused when her car windows blew out and she tried to cover her baby from being hit by the huge hail stones. As the weather bureau issued warning after warning, rain poured across Brisbane and the southeast and winds and hail did vast damage in a belt from Kingaroy to Gympie and on to Maryborough and south of Bundaberg. The bureau used "tornado" to describe the winds. 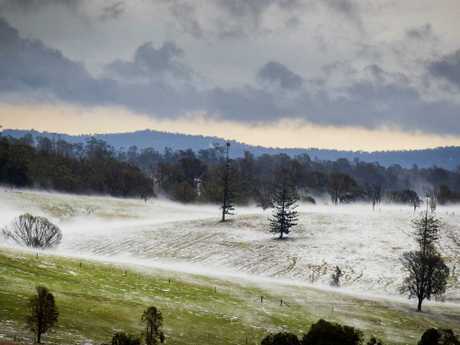 It came after a super cell whipped through northern NSW fewer than 24 hours prior. A Federal man died when a fig tree fell on his house during the overnight storm. 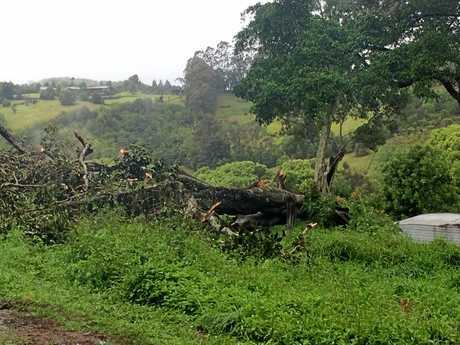 The man, who has not yet been named at the request of police, was inside his Kings Road home when part of a nearby fig tree fell, destroying the structure. A neighbour said he was "always a very good neighbour" and a lovely man. Tweed Byron Police District Inspector Gary Cowan said the "very large fig", about 15 metres from the man's home, had "completely crushed" the building. Schoolchildren in Kumbia endured winds and 7cm hail that smashed buildings before teachers called parents to come and get them early. The tornado hit Tansey, near Murgon, about 3.12pm. It and Murgon, Proston, Yelarbon and Gympie all copped a hail hammering. By 4.20pm Maryborough, Hervey Bay and Tiaro were in the firing line, with the Queensland Fire and Emergency Services issuing another alert for the "Very Dangerous Storm". Hail covered paddocks so deep in ice, parts looked like they had a covering of snow. 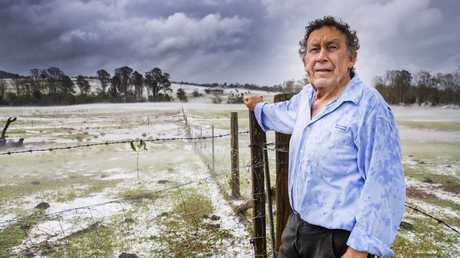 At Long Flat near Gympie, Dave Richardson's farm was covered in hail and fog. 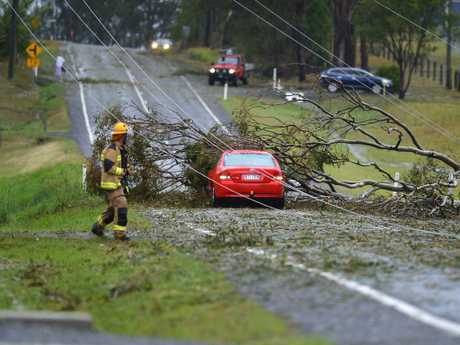 Destructive storm, large hail pelts Gympie: Huge thunderstorms wreaked destruction in Gympie on Thursday afternoon. Despite the damage - he was clearing timber fallen on fences by 3.30pm - he was grateful for the water. "I'll take it any way you give it to me, frozen or liquid," he said. The SES last night had 250 call-outs, with 160 from Gympie, 50 in the South Burnett and 25 on the Fraser Coast. 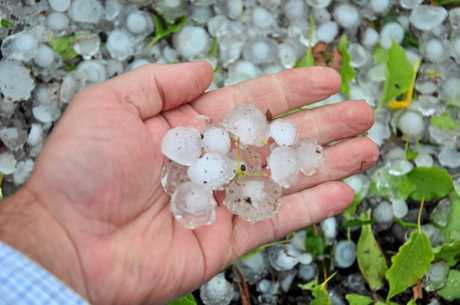 Forecaster Adam Blazak said the storms had "produced… roughly tennis-ball-sized hail and destructive winds". He said the bureau expected a gloomy, wet weekend. "We'll expect to see shower activity increase over the weekend, and it could get a bit windy on the coast," he said. 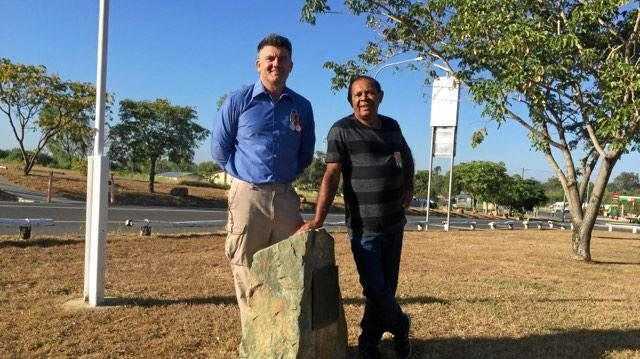 State Opposition Leader and Member for Nanango Deb Frecklington said locals were shaken. "The coming days are going to be tough for a lot of people in my community as they clean up," she said. "We are a resilient bunch, but this will test us. "A lot of farmers were getting ready to pick their crops… and this will be a massive setback." Incredible time lapse footage of storm: This time-lapse video shows Wednesday evening’s storm, approaching Lismore from Casino. The final tornado warning was cancelled at 5.30pm, but the weather bureau said the Wide Bay and Burnett and parts of the Central Highlands and Coalfields, Capricornia, Darling Downs, Granite Belt and South Coast districts were likely to see severe thunderstorms. The severe storm turned the Cooloola Cove Woolworths into something like a movie set, according to customer Kate Whiteway who was in the store when large amounts of water started pouring through the roof. Mrs Whiteway went to the supermarket after collecting her two teenage children from school, when minutes later up to 20 customers found themselves surrounded by flooding water near the registers. 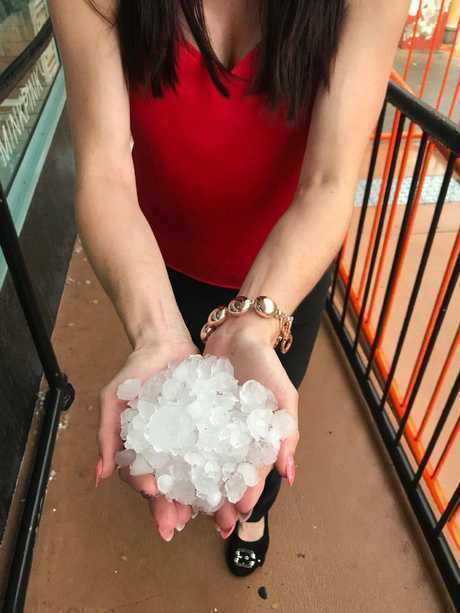 "As I got to the counter hail hit outside," Mrs Whiteway said. Woolworths Floods : Customers were forced to evacuate the Cooloola Cove Woolworths when it was inundated with water in yesterday's severe storm. Richmond Tweed SES community engagement co-ordinator Janet Pettit said they had 17 calls for assistance on Wednesday night. "A lot of them were leaking roofs and trees down," Ms Pettit said. Of those 17, she said there were about eight calls in Lismore and surrounds, one in Coraki and the remainder were in the Mullumbimby, Byron and Lismore areas. She urged residents to be prepared for any further storms.